The ever popular annual Valentine’s Day shoot was hosted by Tsumeb Archery Club in Tsumeb last Saturday. Nel made it clear to his competitors that he is determined to keep the number one position as he secured a total score of 695/720 on the 50 meter target. His competitors were left in the dust as his closest nemeses Jacques van der Merwe and Riaan Vermaak respectively took the 2nd and 3rd spots with respectable scores of 668 and 653. The season is off to a good start for Nel because has been steadily working towards his first 700 score and with the most recent shoot it seems that he will reach his goal at the next competition. Ilana Malan, Namibia’s number one women’s compound archer scored an even match with archer Babette Taljaard in the 720 round both ending with a score of 674. However during the elimination round, Malan proved to the much younger Taljaard that experience counted in the favour and Taljaard had to settle for the silver medal. 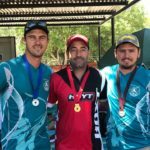 Namibia’s three young and upcoming recurve archers, Quinn Reddig, Adriaan Grobler and Christiaan Brandt moved to their new distances of 70 meters at the beginning of the year, and with 2019 being a qualifying year for Olympics Tokyo 2020 their work is cut out for them to improve their scores significantly during this season. The three archers had decent scores of 556, 605 and 490 but to compete in the Olympics a huge amount of training and preparation will be needed to help them improve and achieve this dream. 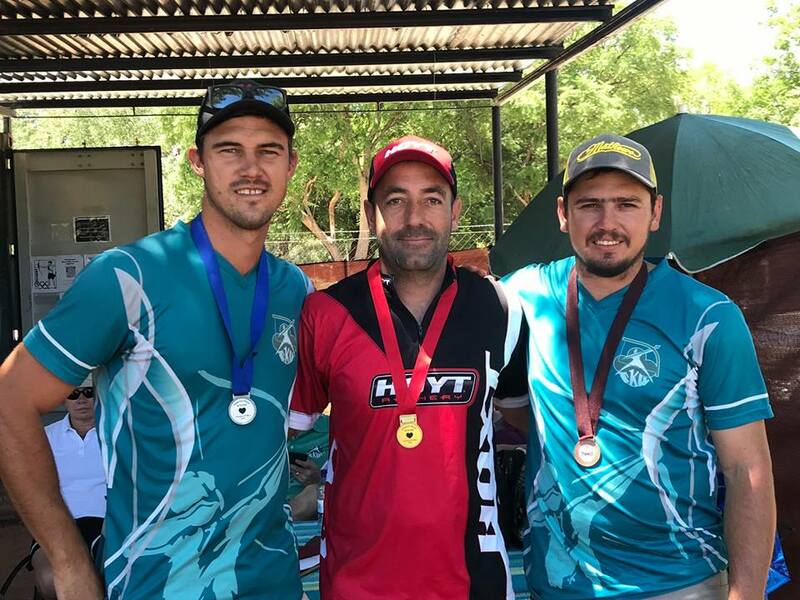 Three beginners on the shooting line, Ricardo Alves, Dimitri de Wee (compound) and Kristiaan van Breda (recurve) are slowly working towards participating at the correct distances by the end of the year. All three archers shot at a distance of 30 meters on Saturday and they are excited to rise up to the challenges of 50 and 70 meters by the end of the year. Three Robin Spot prizes were awarded to archers who shot an arrow closest to the centre of the target. These trophies were won by Kristiaan van Breda, Pikkie Robinson and Ilana Malan. The next archery competition will be the Independence Shoot held on 23 and 24 March. For the first time this shoot will be hosted by the new Swakopmund Archery Club with full support from the Archery Association of Namibia.